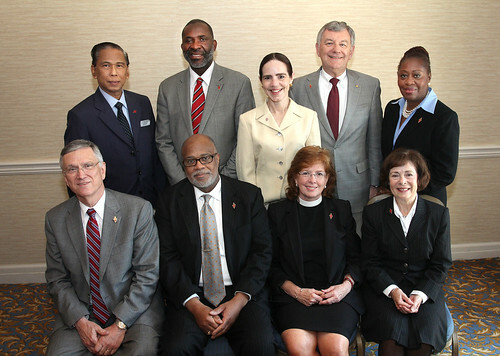 The Judicial Council from the 2008-12 Quadrennium pose for a group photo during the 2012 United Methodist General Conference in Tampa, Fla. Seated, from left: Belton Joyner, Jon R. Gray, Susan Henry-Crowe, and Kathi Austin Mahle. Standing from left: Ruben T. Reyes, Dennis Blackwell, Beth Capen, William B. Lawrence and Angela Brown. A UMNS photo by Kathleen Barry Click on image to enlarge.View more photos. A compromise restructure plan for The United Methodist Church, adopted May 2 by the 2012 General Conference, was declared "unconstitutional" May 4. That unanimous ruling came from the nine-member United Methodist Judicial Council, which had been asked by General Conference to make a declaratory decision on the constitutionality of Plan UMC. "Under the Constitution, the creation and establishment of general Church boards and agencies, the fixing of their structure, the determination of their functions, duties and responsibilities, and the establishing of Church priorities are legislative functions reserved to the General Conference alone," said Judicial Council Decision No. 1210. "These legislative functions may not be delegated." The establishment of a "General Council for Strategy and Oversight" under Plan UMC does not meet the test of constitutionality because it intrudes into the constitutional authority of the Council of Bishops for general oversight of the denomination, the court found, and "commingles" the role of the bishops and the strategy and oversight council. "It creates an overlapping authority for which no constitutional authorization exists," the decision said. The plan also "unconstitutionally delegates" the General Conference's authority for distributing funds to the General Council for Strategy and Oversight. As adopted on May 2, Plan UMC would have slightly re-aligned the denomination's 13 general agencies. The plan retained the General Council on Finance and Administration and four general program boards - Higher Education, Global Ministries, Church and Society and Discipleship - but combined the commissions on the Status and Role of Women and Religion and Race into a "Committee on Inclusiveness." The current Commission on Archives and History would become a committee of the finance agency. In its decision, the Judicial Council acknowledged the legislative authority of General Conference. "In reviewing acts of the General Conference for constitutionality, our first inclination is to save legislation, if at all possible, and not destroy," the court said. "Although the adoption of Plan UMC by the General Conference came through a tortured course, and outside of the established legislative processes, we do not review those processes. Our review in this case is confined to constitutionality. "We have reviewed the plan to determine whether any part, portion or all of Plan UMC can be saved and conclude that it cannot." "Such boards and agencies as the General Conference establishes under its constitutional authority may not determine policies of the Church, nor may they determine their own functions except as such action is consistent with actions already taken by the General Conference." In both Memorandum 1209, on the clergy-laity matter, and Memorandum 1211, on the guaranteed appointment matter, issued May 4, Judicial Council said it "does not have sufficient time to process the case and render an opinion in response to this request before adjournment of the 2012 General Conference. This matter is deferred to the Fall 2012 Docket."